How many of you have ever felt confined by your mouse? As an entrepreneur and gamer, I feel like this quite a bit, especially while we are traveling. I hate the touchpad on my laptop, and feel that an external mouse is superior when it comes to almost any task, especially gaming. Unfortunately, having the room for an external mouse and mouse pad can be tricky, especially if you are working in a car or very limited space such as an airplane, or some hotel desks. While there are some products on the market designed to make tasks like this easier, they are crazily expensive, putting them out of the budget of a small business owner and blogger like myself. At least, this was what I thought until recently when I learned of a new product that sounded perfect for people like me – the Mycestro! Looking for a useful and stylish mouse to make presenting or working on the go even easier? 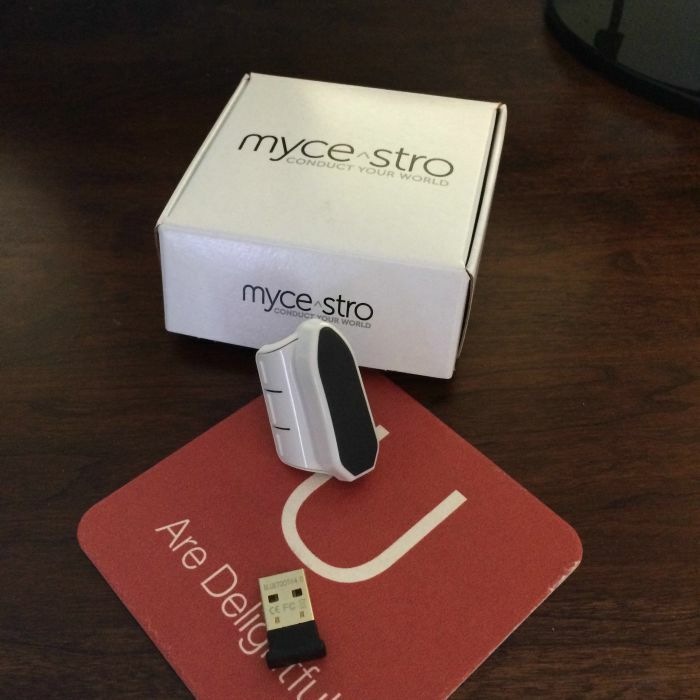 Is so, we think you will love the Mycestro! Never heard of this unique mouse? Well, we personally think it is one of the coolest tech products to come out in years! 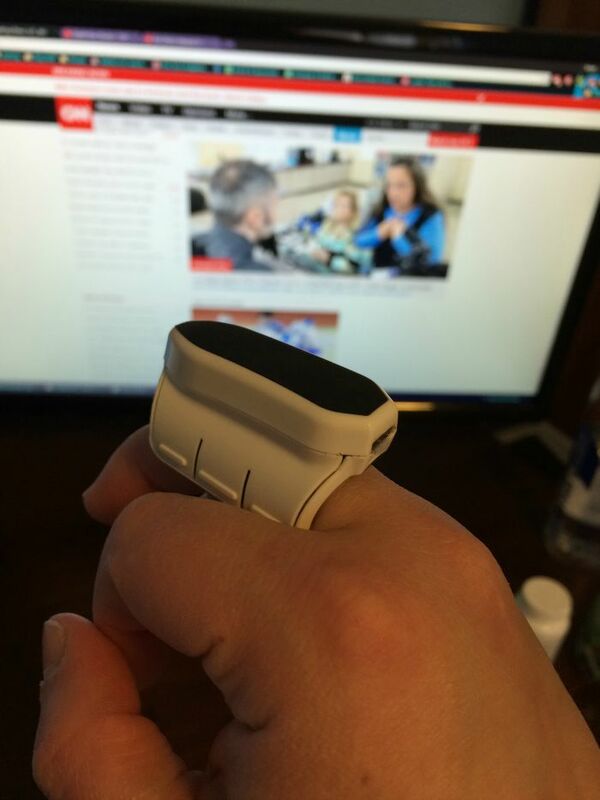 It is a lightweight, ergonomic mouse that you wear right on your finger! You control the cursor with your natural gestures, allowing you to rest your arm however is most comfortable for you. Best of all, it has a connection range of up to 30 feet, allowing you to control your computer, tablet, or other device comfortably just about anywhere. No longer will you have to worry about juggling a mouse on a flight, or fighting with a clunky mouse or touchpad while watching movies on your computer. To learn more about this revolutionary mouse, watch the video below! Okay guys, I am happy to say that the Mycestro is one of the coolest tech products I have played with in quite some time. The mouse not only feels comfortable, but is very intuitive. You really don’t even need to look at any directions since you can easily put on and go. For me, this is pretty great, since it works fluidly for me browsing websites, even with my dual screen setup. Honestly, I can’t wait to try it out with various games and other devices in our house. I will say though that you do need to be careful – it did seem to have some conflict with other Bluetooth devices I had on my main PC. Make sure you move those devices away before you move to working with the Mycestro. It still works, but it doesn’t perform as seamlessly as it would as the only Bluetooth device near your computer. I know when we go on vacation this will definitely be packed with my laptop, and will be a must on the long flight for my husband and myself. Based on my own experience, I am delighted to give the Mycestro an A rating! Would you like to purchase this awesome myself for yourself or someone you know? If so, head over to the Mycestro website and see this awesome myself for yourself. Currently, the Mycestro sells for $149.00, making it a perfect gift for any business or person who is constantly on the go! Also, don’t forget that this is a super cool gift for gamers as well, who want more control while gaming. Also, we are excited to announce a special discount for anyone coming from Budget Earth, until September 15th! All you have to do is click on our Mycestro link, push I want, share, and you get a spiffy coupon code! Make sure to take advantage of this awesome deal, everyone! well this is wicked neat. it does cost to much for me. I like it. It would be ideal for people that use the computer for work. And, I imagine that pretty much everyone that works uses one these days. This is the coolest thing I’ve seen in a long time. I think it would really be useful. This would be great for using with the tv. I always have so much trouble moving the mouse around the screen. That is so cool! I got to have one of these! This would be perfect when you are trying to roll a mouse on uneven surfaces! Wow! This so neat! I am not comfortable using the touch pad on my laptop and my external mini- mouse is a little awkward! This might be a great alternative! I am going to keep an eye on this product around the time of Black Friday and Cyber Monday. I cannot get over how unique and innovative this gadget actually is. This is a definite must for the future. Everyone in my family has had occasional frustrations with the computer mice on both our desktops and laptops. This sounds like a perfect solution to an otherwise unsolvable problem! It’s about time that the technology companies got wise to a product like this one which happens to be so user friendly! I think hubby would like to have this, our boy too! Great gift idea! Oh my goodness, I want one of these so badly. What an amazing gadget. I HATE using my laptop’s touchpad. I use a wireless mouse and a mouse pad over my laptop’s touchpad but have to move it every time I want to type. Then my wrist will start to hurt. The price is a bit high for me to purchase at the moment, but it is definitely something I want. I have never seen anything like this before, thanks for sharing. That looks amazing.I am so bad with these things! I have a finger mouse, but mine is not wireless. It certainly takes some getting used to. I would love to try Mycestro. Thank you for sharing this review. I had never heard about this until now ! , wow this is awesome !! , coolest electronic i have seen in a while ! I like that you gave this an A rating. I was really curious to hear about how it actually felt and functioned. I’m not sure if I could get used to it. I likehte concept though. This mouse intrigues me! I too feel that a mouse just works better but space constraints have me relying on a laptop touchpad. This wireless mouse would change my life! I have something similar to this, but mine is black and has a wire. This is a very neat idea for a mouse. I would love to have one of these, especially for my laptop! I have RA, so using the touchpad on it really hurts my hand/fingers after awhile. This is definitely an amazing product! It’s awesome that you received this as a free sample, however, the company that makes this product has completely neglected its duties and promises to their customers. It was originally funded as a kickstarter campaign, over 2 years ago, and they have yet to deliver the units ordered to most of us, and refuse to respond to emails and inquiries. So if you are reviewing/thinking of getting the product, please keep in mind that the company that makes it is flaky and is currently selling their product and giving out samples while telling their backers that they don’t have enough to fulfill promises made TWO YEARS AGO. I honestly had no clue! When I was approached, it was from an outside company working with Mycestro and I didn’t even know they had a Kickstarter. Is there any way you can provide me with your email so I can forward it the contact I have working with Mycestro? I would like to see this worked out and the email you used is unusable since you put ***@gmail.com. I can only base my review off of my own experience with the product and so far, it is has been very good for both my family and myself. You are also welcome to send your email privately at susan.l.bewley@gmail.com. 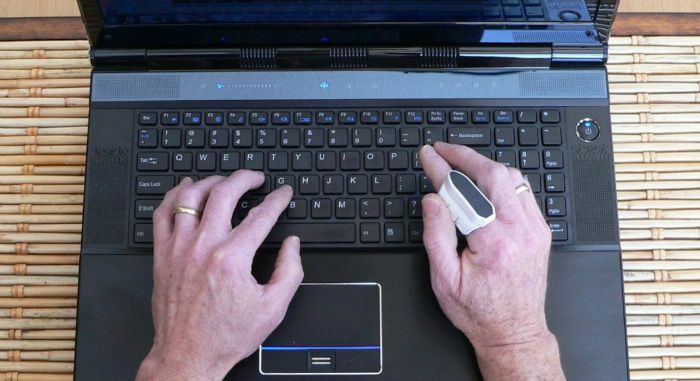 I do a lot of typing as a medical transcriptionist, this would be something nice and ergonomic to use. Thanks for posting this review! This is really neat and I could see it working well in a lot of different instances, I think my son would love it for gaming if it worked with the ones he plays. This looks really cool! I’m on a computer all day and this would make my life so much easier, thanks for this review! WHOA!!! That is awesome!! I could really use that on my home PC. I’ve never seen or heard of these. I would love one here at home working on the computer all day. I know my husband would love one at work all day too. Offices should know about this great device. It would help everyone that works on a computer, which is everyone these days. Wow! This is cool looking . I could certainly use this for when I do things on my computer. It would make things so much easier.